Why Work with Xtreme Snow Pros? That’s our cornerstone foundation here at Xtreme Snow Pros. We are never satisfied with the status quo. We know that like every industry, ours is constantly changing, with new equipment, improvements, and technology available for integration into the process. By committing ourselves to relentless continual improvement, our team never rests to accept mediocrity. We are in a never-ending pursuit of company improvement so that at the end of the day, we provide our clients with the very best snow and ice removal services available today. This message is the best way to describe where our operation is right now. Constantly researching new ways to provide a seamless snow and ice removal process for our commercial clients, we are in the process of having our staff certified in new removal techniques, while also working to integrate new products from our sister companies for the most streamlined removal service possible. Our Business Developer, Joe Capobianco, is now ASCA certified by the Accredited Snow Contractors Association for his expert knowledge of industry standards. 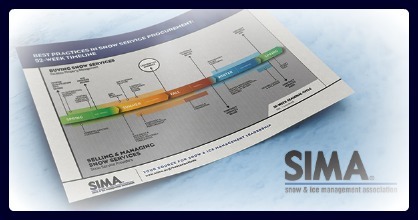 Even more telling, our team is presently attending the first class of ASM University, owned by Snow & Ice Management Association (SIMA), to complete a program for nationally recognized credentials. We’re passionately committed to harnessing technological innovation in our process, and we offer real-time weather monitoring and GPS tracking of crewmembers with client portal access. We use LiveEdge Technology to reduce the use of salt for helping surrounding environments and wildlife. We use remote webcams to monitor live weather and continuous updates. We send storm alerts out through our automated platform to clients up to 3 days in advance before an impending storm. And we offer immediate communication channels through email to keep our clients alert, and ensure we provide the answers everyone is looking for at a moment’s notice. Though this is a great place for us to be in right now, we’re never satisfied with relaxing and sitting back. We know that new technological tools will be developed this year to ensure our salt usage, property care, and real-time monitoring is even more seamless. In the mean time, to guarantee our high quality of performance demand is always met, we put our potential staff through Xtreme University first before they can join our TeamX. We not only test them rigorously through paper testing, we also put them through simulated real-life scenarios to see if they have what it truly takes. There is only one word appropriate for describing us: relentless. Don’t consider working with a service company that isn’t as passionate about being relentless as we are.